Giganotosaurus Carolinii and Tyrannosaurus Rex are among the biggest carnivores in the dinosaur family. Though they lived in different prehistoric eras, their constant comparison brings to light the existence of such gigantic creatures. An interesting peek into the intriguing history of these creatures with AnimalSake's Giganotosaurus vs. T Rex comparison will help you understand the difference between them. 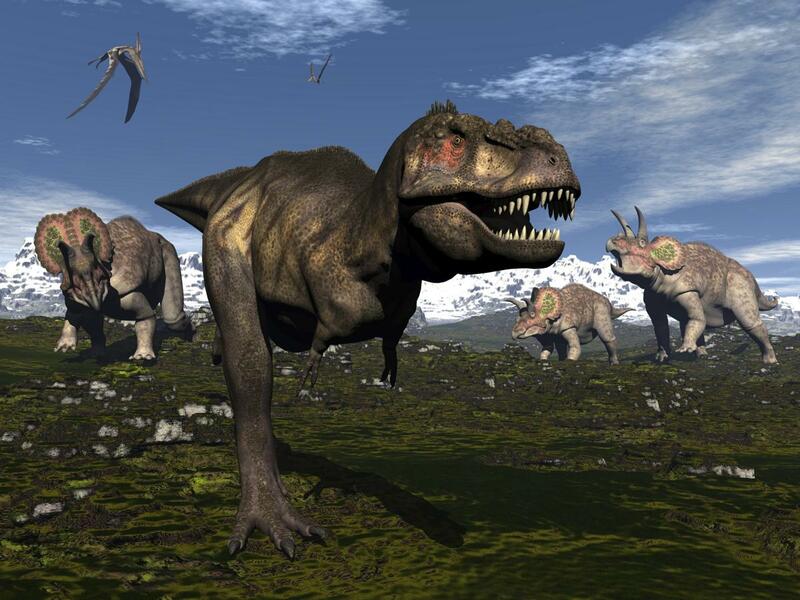 Teeth belonging to Tyrannosaurus Rex were found in 1874 by the geologist Arthur Lakes, near Golden, Colorado. In 1993, an amateur fossil hunter Rubén Dario Carolini found a Giganotosaurus skeleton in Patagonia, Southern Argentina. Michael Crichton's novel Jurassic Park (1990) introduced the readers to the world of dinosaurs. The novel was adopted into a movie series, Jurassic Park (1993) being the first part, recreated their existence on screen. It certainly tickled the curiosity in people to want to know more about them. A deeper study in paleontology discloses that both these dinosaur species―Giganotosaurus Carolinii and Tyrannosaurus Rex―were powerful. Now, the question arises as to who is more powerful than the other? If we had a time-machine, we could walk back into the prehistoric era to find the answer. A comparison chart on the known facts of the carnivores exhibits the differences between the two. ➥ Giganotosaurus means Giant Southern Lizard. In Greek, gigas means giant, notos means southern, and saurus means lizard. ➥ It was first discovered in 1993. Its existence can be traced to the Cenomanian Age of the Late Cretaceous Period (100 to 97 million years ago) in South America (present-day Argentina). ➥ Length: 40-46 feet, Height: 23 feet , Weight: 6-13 tons. Its head is larger than an entire human, but has a relatively smaller brain. It has 2 short arms with 3-fingered hands and a short, thin, and pointed tail. Its teeth are sharp with a length of up to 8 inches. ➥ Tyrannosaurus means Tyrant Lizard. In Greek, tyrannos means tyrant, and saurus means lizard. Rex means king in Greek. ➥ This giant was discovered in 1874 and existed as far back as the Maastrichtian Age of the upper Cretaceous Period (67 to 65 million years ago) in Western North America and Mongolia. ➥ Length: 40 feet, Height: 15-20 feet, Weight: 5-9 tons. It has a massive and thick skull with a large brain. It has 2 little arms (smaller than Giganotosaur's) with 2-fingered hands and a long and heavy tail. Its teeth are sharp with a length of up to 12 inches. 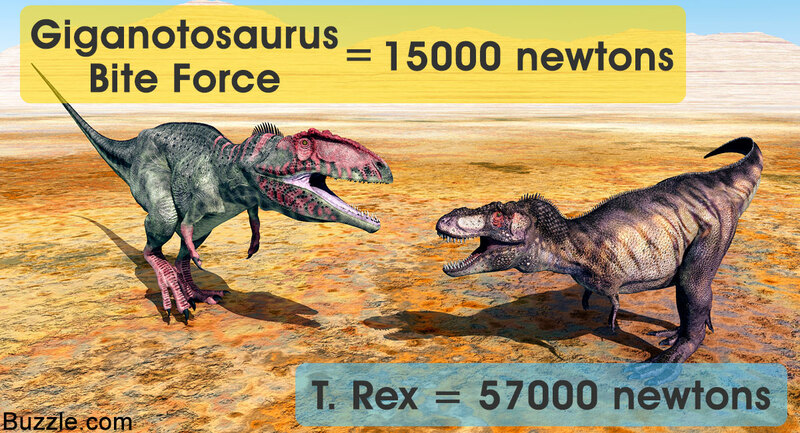 With an insight into the differences between the two dinosaurs, it is yet to be proved who is more powerful. The fact that they are extinct makes it even harder to estimate. Experts have, with the available information, compared them to animals who resemble them in some aspects and have developed computer software which have games showing both giants engaged in a battle. The game focuses on their physical traits and qualities that could lead to either one of them being victorious. An amazing discovery is the bite force that each one possesses. 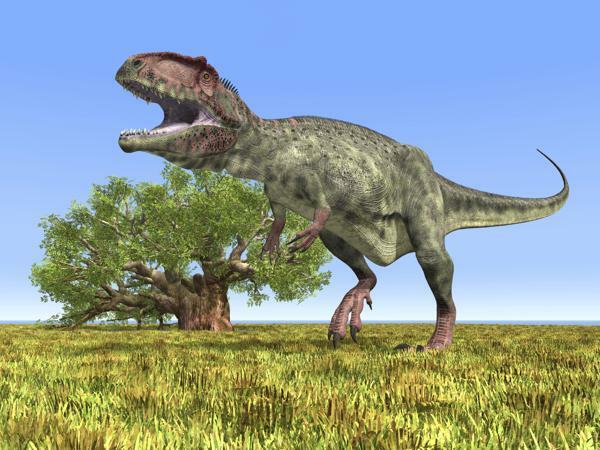 Tyrannosaurus is believed to have had a bite force of 35,000 to 57,000 newtons; however, Giganotosaurus's powerful bite―11,000 to 15,000 newtons―can cause the Tyrannosaurus to bleed to death. with their respective features from the comparison chart and check it out for yourself. Who is the winner?? ?